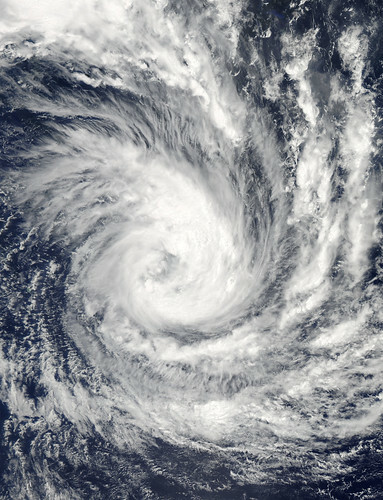 Tropical Cyclone Glenda took a five day tour of the Southern Indian Ocean in late February, 2015. The storm formed from a low pressure system, System 90S on February 24, when maximum sustained winds reached 40 mph (64 km/h). The Moderate Resolution Imaging Spectroradiometer (MODIS) aboard NASA’s Aqua satellite captured this true-color image of Tropical Storm Glenda on February 25 at 08:55 UTC (3:55 a.m. EST). At that time bands of thunderstorms wrapped into the low-level center of circulation. An eye was beginning to form. At 0900 UTC (4 a.m. EST) on February 25, Glenda's maximum sustained winds were near 63.2 mph (102 km/h). It was centered near 17.6 south latitude and 69.1 east longitude, about 760 miles (1,224 km) south-southwest of Diego Garcia. Glenda was moving to the west-southwest at 8 mph (13 km/h). At that time, the Joint Typhoon Warning Center expect Glenda to strengthen to near 109 mph (176 km/h) before beginning to weaken. However, strong wind shear began to affect the storm. By the afternoon of February 26 Tropical Cyclone Glenda’s winds had dropped to about 58 mph (93 km/h), and by February 28 the storm had transitioned to an extra-tropical storm.